A serious warning is now going to Justice Binta Nyako of Nigerian Federal High Court in Abuja Nigeria to as a matter of urgency release all the Biafra detainees she remanded in Kuje prison for almost 3 years now without trial or risk facing International Judicial Arena over a serious injustice inside court which she preside over. 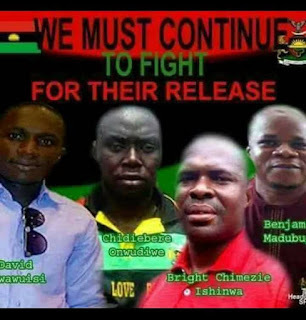 Let nobody forget in a hurry that Justice Binta Nyako has remanded in Kuje prison without trial three Biafran agitators like Benjamin Mmadubugwu, David Nwawuisi and Chidiebere Onwudiwe for 3 years without showing any seriousness in either granting them bail or commencing the trial or at best discharge them if Nigeria government has failed to prove the case of treasonable felony preferred on the agitators as it is obtainable in the eyes of the law. It is height of wickedness and injustice for Justice Binta Nyako to use the power of court to remanded an accused persons for three calendar years when the plaintiff has obviously shown that he has nothing to prove the case instituted before her court against the accused agitators. Justice Binta Nyako, may I tell you that if you have spent 3 good years arguing with prosecuting and defense counsels on bail application which always culminate in needless adjournments without any achievement in each court sitting, then you are demonstrating to the world that you are not qualified to be a Judge in the first place not to talk of handling the case under reference. How can a Judge not be bothered that accused persons who could be innocent after trial especially when the plaintiff is jumping from one case amendment to the other, not care about the release of the remanded accused persons? In fact, the disposition of Justice Binta Nyako on the case between Nigeria government and these Biafran agitators has shown that she is either compromised or intimidated by the power that be in Nigerian State. It is upon this ground that I consider it necessary to call on Justice Binta Nyako to quickly grant bail to Benjamin Mmadubugwu, David Nwawuisi and Chidiebere Onwudiwe as the court which has obviously lack judicial powers vested on it to compel Nigeria government to produce evidences of treasonable felony against the detainees, can go ahead and continue to adjourn the case till eternity as it usually do; but will not continue needless adjournments while some people are unlawfully remanded in Kuje prison over the case. It is immeasurable injustice to remand somebody in prison for almost three years and the Judge continue to feel less concerned in compelling the plaintiff to prove his case or have the case strike out for onward discharge of the accused. Does Justice Binta Nyako actually understand the damages and compensation that is due to an accused person detained for three years should the person finally got vindicated after trial? However, in this case under reference, Justice Binta Nyako who should defend justice is aiding injustice and tyranny against Biafra agitators. If Justice Binta Nyako fail to grant bail to these above listed Biafra detainees or at best acquit them as it is already obvious to the world that they are only being detained for agitating for Biafra, then Justice Binta Nyako should be ready to be dragged to International Judicial Arena for desecrating the temple of Justice in Nigeria through judicial misconduct on the case under reference. Let it be known to the world that these Biafran agitators have never denied their agitation for Biafra self-determination with a serious demand for referendum, but has carried out their agitation within the ambit of both local and international laws and protocols governing self-determination. The agitators have not raised any arm against Nigeria government or attack any individual or institution within or outside Nigeria and that was why it has taken Nigerian government up to three years and yet it cannot front any reasonable evidence of crime against these agitators in court. Justice Binta Nyako should grant bail to these detainees and after that quickly open the case file and let the two counsels debate on legitimacy and legality of Biafra agitation in eyes of both local and international laws and conventions. Detaining those agitators for peacefully demanding for Biafra referendum with the aid of Justice Binta Nyako in court is denting the image of Judiciary in the international arena. Justice Binta Nyako should be ashamed of herself that a case file bothering on treasonable felony against Biafra detainees was lodged in the court she preside over and she cannot open the case file for 3 years now but only continue to do needless adjournment upon adjournment in order to buy time for detention on the innocent agitators so as to please the ungodly yearning of a tyrannical government of Nigeria.